S&S Slash-Cut style shotgun slip-on performance dual mufflers for 2007-'16 HD Softail Deluxe, Blackline, Cross Bones, and Slim models. All steel construction with a show chrome finish. Fits on stock header pipes. One of the most popular and cost effective performance upgrades you can make to a Harley-Davidson® motorcycle is to replace the stock exhaust with a set of low restriction, high performance mufflers. 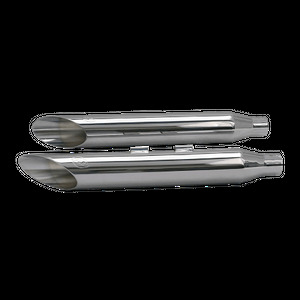 The stock exhaust pipes and S&S performance mufflers make a great high performance exhaust system with a low price tag. 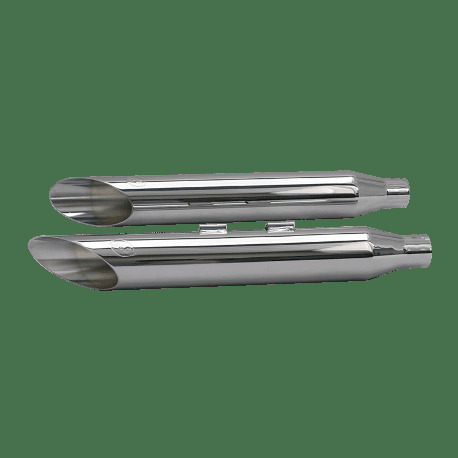 S&S Slip on mufflers are great for stock displacement engines, and they provide exceptional low end and midrange torque when used with big inch engines. Performance exhaust will enhance the effectiveness of other performance upgrades like carbs, air cleaners, cams, and increased displacement. Carburetor or fuel injection adjustments are generally not required, but are recommended for best performance.